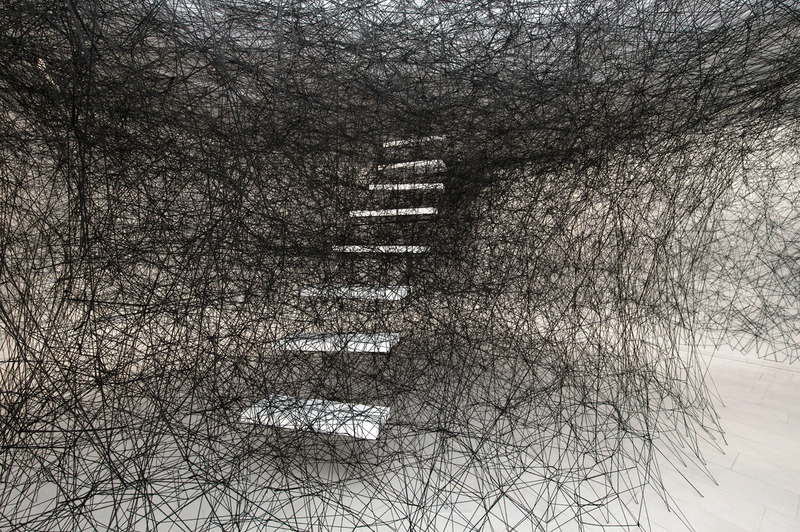 PennsylvAsia: Postponed Chiharu Shiota "Traces of Memory" exhibition to open October 4. Postponed Chiharu Shiota "Traces of Memory" exhibition to open October 4. "Stairway", from Chiharu Shiota's official website. Central to the artist’s work are the themes of remembrance and oblivion, dreaming and sleeping, traces of the past and childhood and dealing with anxiety. Shiota explores the relationship between waking life and memories through hauntingly beautiful installations that incorporate everyday objects like shoes, pianos and hospital beds encased in webs of yarn. Stretched in multi-layers in a gallery space, Shiota weaves disorienting cocoons of black yarn that reflect the artist’s desire to ‘draw in the air’. The site-specific installation of new works by Shiota will fill the eight rooms in the building at 516 Sampsonia Way—a 19th-century row home with a storied past—which is suited to the artist’s work. Its interior is cosmetically untouched; the raw condition of the building lends itself well to reflections on the past and the conjuring of memories. It will run through May 31, 2014.